7 w w w. s p i r i t o f w o m e n . c o m S U M M E R 2 015 S P I R I T O F W O M E N PHOTOGRAPHED Y CHRISTINE PETKOV Recipes Chicken and Spinach Salad with Greek Yogurt Dressing ¾ pound boneless, skinless chicken breast ¾ cup reduced-fat plain Greek yogurt, divided 1 garlic clove, smashed 1 medium-large cucumber, peeled and thinly sliced 4 cups baby spinach leaves 2 scallions, trimmed and thinly sliced 2 teaspoons olive oil 1 tablespoon white balsamic vinegar 1 tablespoon minced fresh dill weed ¼ teaspoon salt ¼ teaspoon pepper Per serving: 235 calories / 7 grams total fat / 34.5 grams protein / 7 grams carbohydrates / 87 milligrams cholesterol / 352 milligrams sodium / 2 grams dietary fiber SLICE chicken breast widthwise to make even, 1 /3- to ½-inch thick slices. PLACE in shallow bowl. STIR in 6 tablespoons yogurt and garlic clove. COVER and refrigerate 1 to 2 hours. REMOVE excess yogurt from chicken; discard with garlic. PLACE chicken on aluminum foil-lined baking sheet. ROAST in preheated 400-degree oven for 20 minutes or until chicken is cooked through. Meanwhile, COMBINE cucumber, spinach and scallions in large salad bowl. For dressing, COMBINE remaining yogurt, oil, vinegar, dill weed, salt and pepper in small bowl. STIR well. When chicken is done, REMOVE from oven. SET aside 5 minutes. CUT chicken into bite-size pieces. ADD to vegetables. ADD yogurt dressing. TOSS gently but well. Makes 3 (2-cup) servings. Bring moisture to lean chicken breasts with a Greek yogurt marinade. Then double up on favor by using more Greek yogurt in a dressing for the cooked chicken. What's in your Greek yogurt? Along with the many tempting favors of Greek yogurt at your supermarket comes added sugar, which means more calories and, in some cases, artifcial favorings and thickening agents. Ideally, Greek yogurt should have only two ingredients: milk and active, live cultures, says Dr. Sonali Ruder. "Buy a clean product. The fewer the ingredients, the better," she says. To avoid excess sweeteners and unnecessary additives, Dr. Ruder suggests choosing fat-free Greek yogurt and favoring it to taste so you can control the amount of sweetener you add, such as honey, maple syrup or chopped fresh fruit. is more apt to curdle in hot dishes, such as a sauce or soup, especially if it's added early on. Dr. Ruder recommends using a low-fat version of Greek yogurt instead. To further reduce the risk of curdling, she suggests stirring the yogurt into a hot dish at the last minute. Of course, using Greek yogurt in cold dishes eliminates the problem. 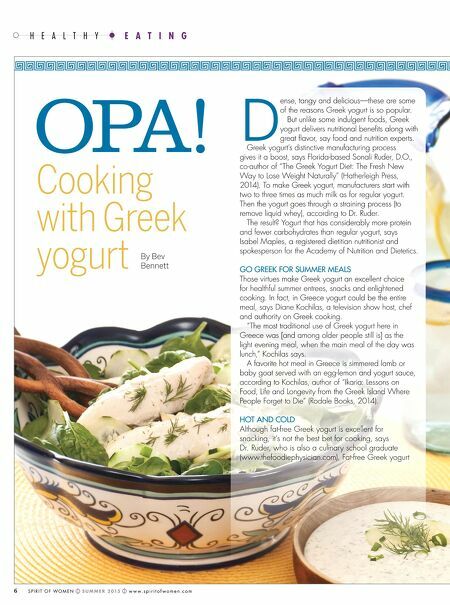 For light summer meals, Greeks use plain yogurt in a dip, such as tzatziki sauce (a garlicky, tangy combination of yogurt, cucumber, dill and lemon juice), says Kochilas. The lively tasting yogurt can also serve as a welcome switch from full-fat mayonnaise or sour cream in salad dressings, according to Dr. Ruder. "For cold salads, such as chicken salad, use Greek yogurt as a substitute for mayonnaise," she says. 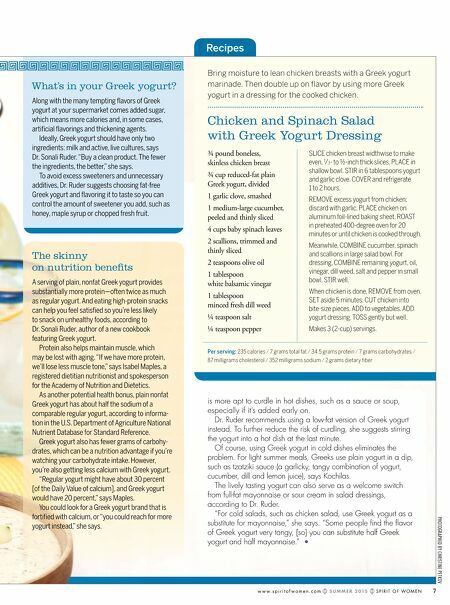 "Some people find the flavor of Greek yogurt very tangy, [so] you can substitute half Greek yogurt and half mayonnaise." • The skinny on nutrition benefts A serving of plain, nonfat Greek yogurt provides substantially more protein—often twice as much as regular yogurt. And eating high-protein snacks can help you feel satisfed so you're less likely to snack on unhealthy foods, according to Dr. Sonali Ruder, author of a new cookbook featuring Greek yogurt. Protein also helps maintain muscle, which may be lost with aging. "If we have more protein, we'll lose less muscle tone," says Isabel Maples, a registered dietitian nutritionist and spokesperson for the Academy of Nutrition and Dietetics. As another potential health bonus, plain nonfat Greek yogurt has about half the sodium of a comparable regular yogurt, according to informa- tion in the U.S. Department of Agriculture National Nutrient Database for Standard Reference. Greek yogurt also has fewer grams of carbohy- drates, which can be a nutrition advantage if you're watching your carbohydrate intake. However, you're also getting less calcium with Greek yogurt. "Regular yogurt might have about 30 percent [of the Daily Value of calcium], and Greek yogurt would have 20 percent," says Maples. You could look for a Greek yogurt brand that is fortifed with calcium, or "you could reach for more yogurt instead," she says.